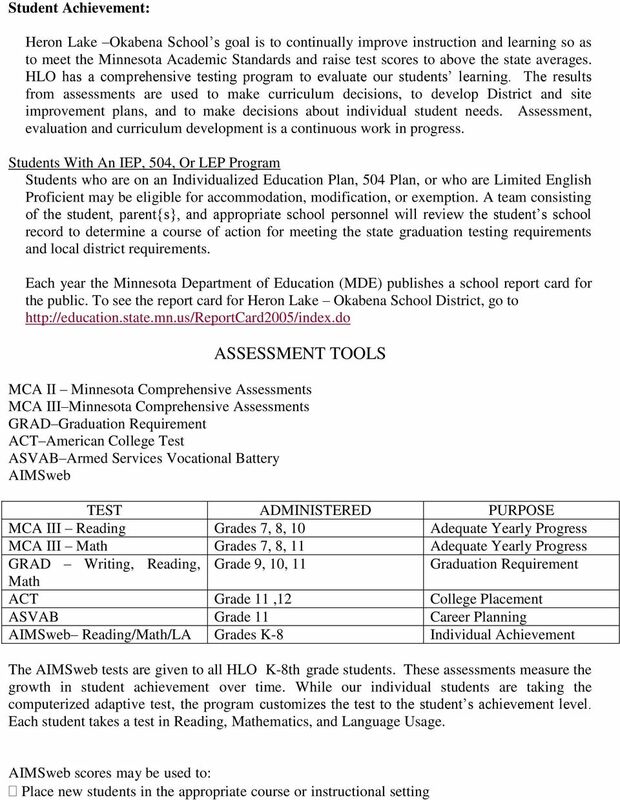 Download "Heron Lake-Okabena School District ISD 330"
2 Heron Lake Okabena School District is composed of kindergarten through sixth grade elementary located in Heron Lake, MN and a seventh through twelfth grade secondary school located in Okabena, MN. We pride ourselves in offering small class sizes, as well as an up-todate, comprehensive curriculum. Our Mission shall be achieved by aggressive pursuit of the following goals: Effective partnerships between staff, students, parents, community Personal and professional staff development Integration of technology in all curriculum areas Experimental learning Safe environment for all Respect for cultural diversity and individual worth Integration of Graduation Standards Cooperative team effort Alternative financial resources Instill an never ending desire to learn The Annual Report on Curriculum, Instruction, and Student Performance for is published in order to keep patrons of District #330 informed of the school district s continued commitment to quality education and programs to meet the needs of all students as well as the Minnesota state testing requirements. Public Notice of the publication of this document will be noted in the Tri-County News newspaper and an electronic copy of this document will be made available online at A paper copy of this document can be requested from the district office. Instructional and Curriculum Advisory Committee The Heron Lake-Okabena School District [HLO] believes that the community should have an opportunity to be involved in the development of the school curriculum. Any person who resides in the school district, or is the parent of an open-enrolled student in the district, may apply for membership on the Instructional and Curriculum Advisory Committee (ICAC). No one will be excluded from membership due to national origin, race, gender, disability, age, nor political or religious affiliations. The term of the membership will be for one calendar year beginning in November. The committee meets up to four times each year. If you wish to become a member for school years, please contact the high school office by November 1: Committee members for the school year included: Paul Bang, Amy Bang, Tracy Freking, Jeanne Rasche, Jill Liepold, Ann Wendorff. 4 Focus instruction for new students Monitor growth in student achievement over time Determine student proficiency related to the district s graduation standards Screen students for Title I eligibility, special education services, and gifted program Heron Lake-Okabena Public School Demographic Information 2013 State Number of Students 845, Ethnicity 2.3% Am Indian, 6.8% Asian, 10.6% Black, 7.3% Hispanic, 73% White LEP 7.8% 12.4% Special Education 14.9% 20.1% Free & Reduced 38.3% 39.0% Attendance Rate 95% 95% Graduation Rate 92% 98% Heron Lake Okabena School Summary of Testing for Annual Report MINNESOTA COMPREHENSIVE ASSESSMENTS District 0.6% Am Indian, 0.3% Asian 15% Hispanic, 0.3% Black, 83.9% White The Minnesota Comprehensive Assessments Series III (MCA-III's) are the state tests that help districts measure student progress toward Minnesota's academic standards and meet the requirements of No Child Left Behind. 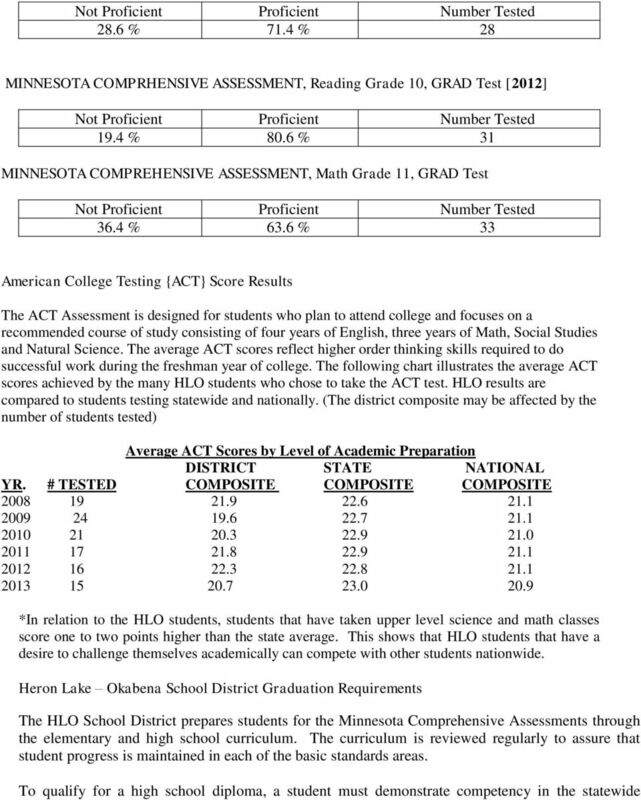 The reading and mathematics tests are used to determine whether schools and districts have made adequate yearly progress (AYP) toward all students being proficient in Science is required for No Child Left Behind but is not included in AYP calculations at this time. 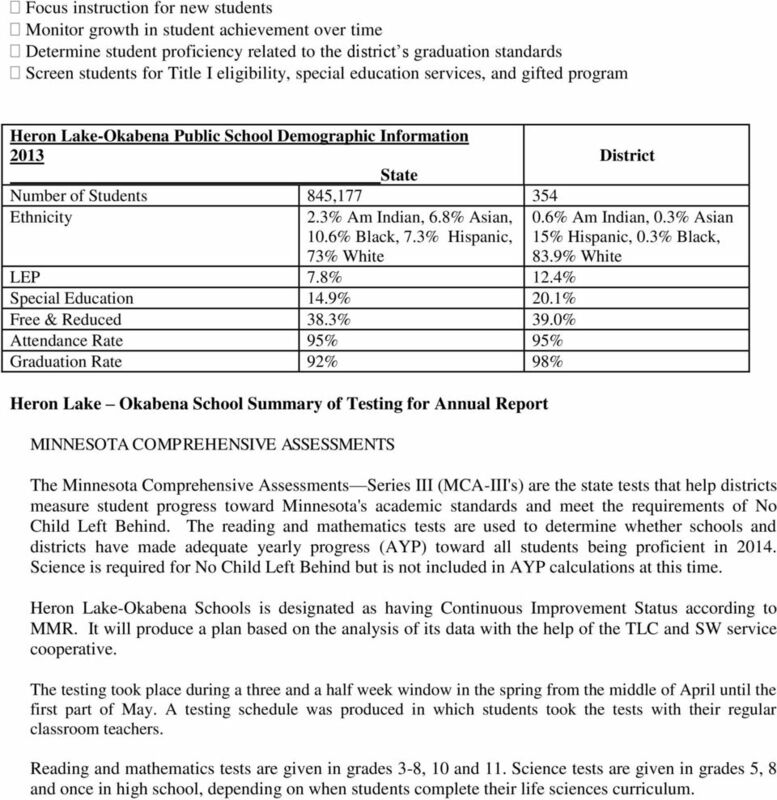 Heron Lake-Okabena Schools is designated as having Continuous Improvement Status according to MMR. It will produce a plan based on the analysis of its data with the help of the TLC and SW service cooperative. The testing took place during a three and a half week window in the spring from the middle of April until the first part of May. A testing schedule was produced in which students took the tests with their regular classroom teachers. Reading and mathematics tests are given in grades 3-8, 10 and 11. Science tests are given in grades 5, 8 and once in high school, depending on when students complete their life sciences curriculum. 7 assessments in writing, reading and mathematics. In addition, HLO students are required to earn 76 of 80 credits maximum during the 9 th, 10 th, 11 th and 12 th grade years in order to graduate from HLO. CREDIT REQUIREMENTS Social Studies 8 credits [1 economics, 1 civics/us Govt., 1 US History, 1 World History] English 8 credits [min. 2 Literature and 1 speech] Physical Education/Health 3 credits [1 Health] Math 6 credits [8 for Class of 2015] Science 6 credits [8 for Class of 2015] Fine Arts 2 credit Future plans of 2013 HLO High School Graduates Attending a four year college: 44% Attending a two year college: 45% Entering the military: 1% Entering the workforce: 10% Staff Development: Current staff development plan is focused on working in Professional Learning Communities. The staff is divided by curricular areas and each is working to establishing in what courses and grades the state standards are taught. The PLC s also analyze student test scores to establish if the students are learning the standards. Individuals may request time or funds to investigate or be instructed in methods to improve student learning. 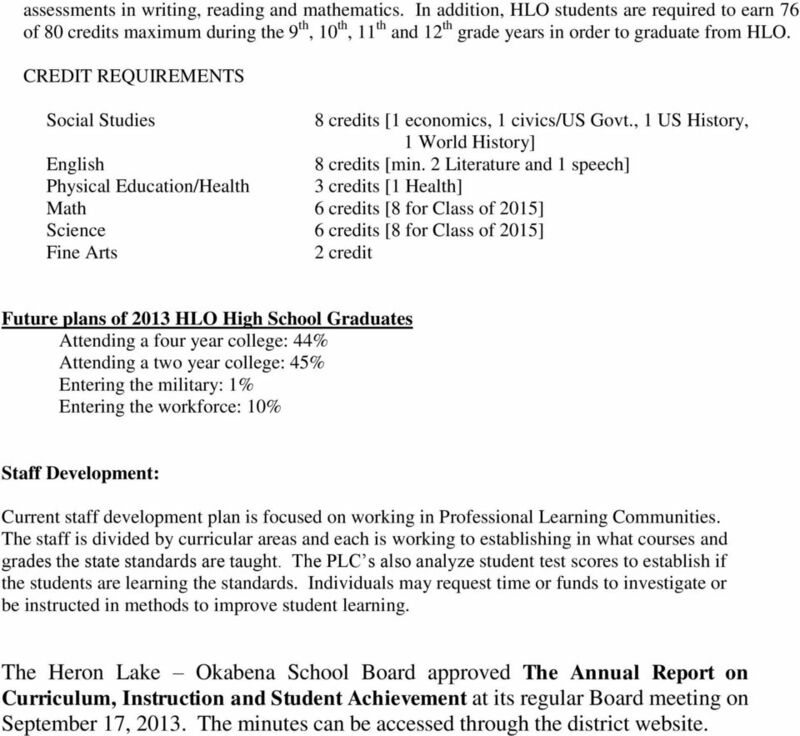 The Heron Lake Okabena School Board approved The Annual Report on Curriculum, Instruction and Student Achievement at its regular Board meeting on September 17, The minutes can be accessed through the district website. 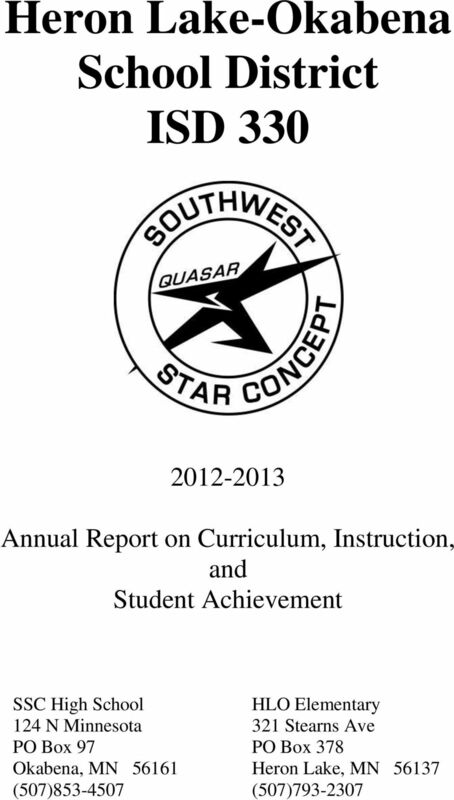 2012-2013 Annual Report on Curriculum, Instruction, and Student Achievement Chokio-Alberta Schools, ISD #771 School districts annually publish an Annual Report on Curriculum, Instruction, and Student Achievement. 160-4-2-.38 EDUCATION PROGRAM FOR GIFTED STUDENTS. Wilder Research. 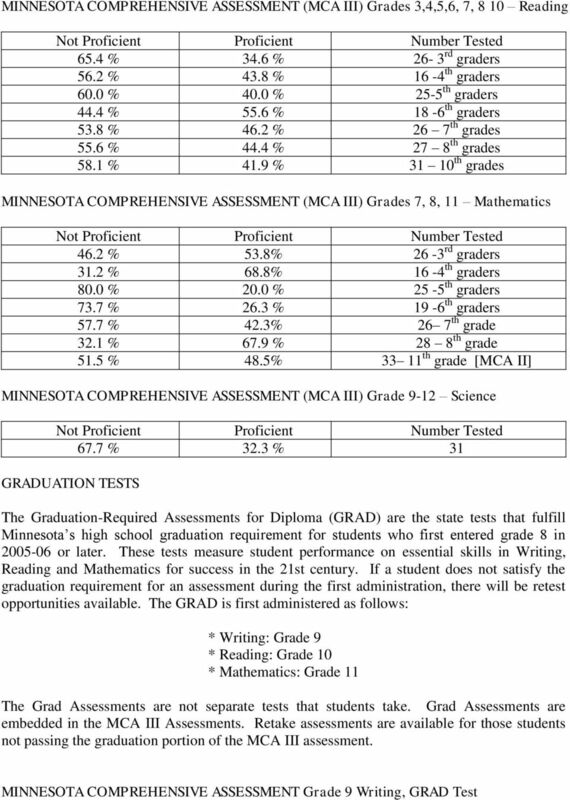 2010-11 Statewide Census of Private Education (SCOPE) Summary of a study of private K-12 schools in Minnesota. Bryan Middle School. Bryan Middle School. Not Actual School Data. 100 Central Dr Anywhere, DE 19900 (555) 555-5555. Administration.